This is a boutique condo with a rooftop swimming pool and a totally unblocked view. It is especially lovely and romantic at night where guests can enjoy soaking in the pool while drinking champagne and enjoying the beautiful view. The apartment is 550 square feet with a big and airy master bedroom furnished with a queen size bed (sleep 2 persons which is included in the booking fees) and a cozy study room with a study table and chair , kitchen, living room (also furnished with a sofa bed and can sleep one person. Maximum number of guests allowed in the house is 3.. The apartment is on a very windy level with very good cross flow ventilation, absolute privacy and also a very quiet ambience. The whole condo is also very windy and guests just like to sit around to enjoy the breeze and unwind over a cup of coffee or beer. 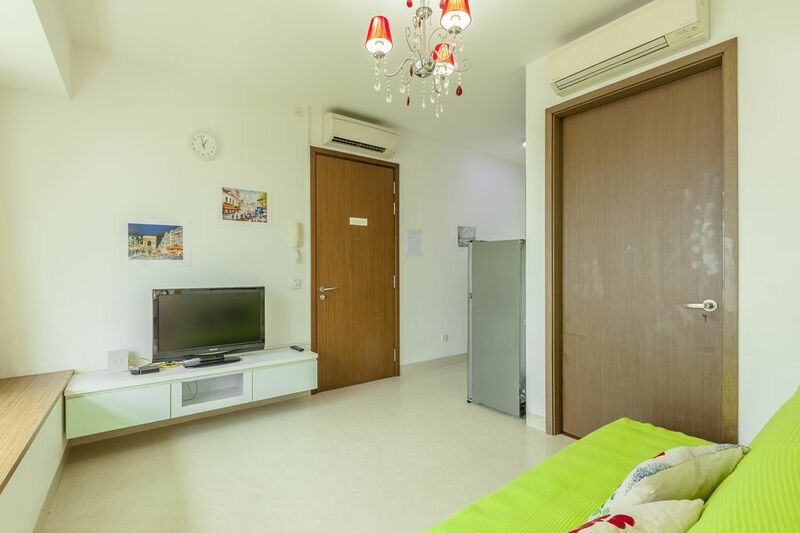 Although the rent I charge is the lowest and the cheapest for a 2 bedroom condo on Novena Road which is situated in a prime district in Singapore the house is however furnished so well that you will find it hard to believe you can have it for that price. Just look at the pictures and the description and you will realize that this house offers you fantastic value for your money. I just want to charge lower just so that more people can afford it and enjoy the house and meet more people from all over the world. The apartment can accommodate at most 3 persons with 2 persons in the master bedroom and another in the living room. Please note the kitchen is only for light cooking like noodles and boiling eggs and please clean up after cooking. Check in is 3pm and check out is 12 noon. Early check in and late check out is available at $10 per hour if there are no other guests. There are 5 shopping malls just outside the condo (Novena Mall, Square 2 Mall, Velocity Mall, Royal Square and United Square Mall) with food courts, supermarkets, pubs and plenty of restaurants operating late into the night. If you are a fan of chicken rice (The Famous Boon Tong Kee Chicken Rice) and bak kut teh (pork rib soup - The Famous Founders Bak Kut Teh) then you must stay here as they are just 5 minutes by taxi away. Orchard Road (the premier shopping belt in Singapore) is also just 5 minutes away by subway or bus. If you are shopping for the latest designer lightings, bathroom and toilet accessories Balestier Road which is just nearby is the place to be as the whole road is dotted with many shops selling these. The condo is also just next to the Novena Medical Hub with 2 hospitals and lots of specialist clinics. It is also just 5 minutes by taxi and 10 minutes by bus to the newest medical hub at Farrer Park with the brand new Farrer Park Hospital. Lots of tourists and foreigners come here to avail themselves of the medical expertise that Singapore is known for. Upon their discharge from acute hospital care, they can book my house for their recuperation and medical follow-up at a much lower cost than the hospital's or staying in a hotel and their family members can stay as well to take care of them while recuperating. Sun Yat Sen Memorial is also just along the road and Gardens by the Bay is also just 10 minutes away by taxi. The apartment looks like the pictures, clean and located in a comfortable area, just walking distance to nearest Novena MRT station and Novena Square mall.